Crewel by Gennifer Albin. Farrar Straus Giroux, 2012. Currently available. Face Value: The ethereal strands of colorful light evoke the visual landscape of the unusual dystopic world that Albin has created. Of course, there is the problem of a sexualized young female face on the cover. It accurately reflects the way that female characters are ritually sexualized in the story – but it’s still not a great way to present a potentially powerful female character. Does it break the slate? To be determined. This is the first book in a series, and Adelice is a character who wields great influence because her unusual talents for manipulating the forces that control the world of Arras. However, Adelice doesn’t use her talent wisely in this book – she is impulsive and often confused as she uncovers the layers of deceit that surround her. She also falls easily into emotional states in which she cannot muster the energy to fight back. I wouldn’t call her a Slatebreaking character yet, but she has the potential to grow into one throughout this series. Who would we give it to? 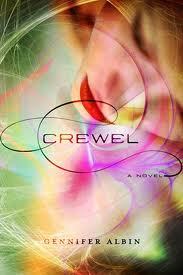 Readers who are still digging the dystopian trend will enjoy the creatively constructed, futuristic world in Crewel. Review: Dystopian novels continue to fill shelves and engage readers of Young Adult fiction. I have mostly tired of dystopian fiction, and haven’t been able to finish most of the dystopian books I’ve attempted to read over the past year. But there was something special about Crewel that attracted me. I love fiber arts (needlework, knitting, quilting, sewing, you name it), and a dystopian world in which female “Spinsters” weave the fabric of reality sounded intriguing. I have always been interested in reading about the ways in which women reclaim and reinvent domestic arts as a feminist act, and Crewel sounded like it might have some of those qualities. I wasn’t quite correct about the whole “reclaiming domestic arts as a feminist act” thing, but Crewel certainly explores gender roles in fascinating ways. In the world that Albin has created, called Arras, reality is composed of a weft and warp of delicate threads that are woven and maintained on government-sanctioned looms. The women who operate those looms are called Spinsters. These women are identified through mandatory testing in their early adolescence, and the girls with talent for weaving reality are retrieved from their homes and taken to government compounds. There they live the rest of their lives in isolation from the outside world. They are required to take vows of chastity and to maintain utmost standards of youthful beauty while carrying on their work as weavers of time and place. Although the life of a Spinster is restrictive, it is also glamorous. Spinsters have the best food and don’t have to abide the rationing restrictions, live in the most luxurious quarters, and have custom-made couture clothing. Girls throughout Arras long to be selected as Spinsters because of the way the media fetishizes their lifestyle. Beyond secretarial work and teaching, the Spinster role is a girl’s only hope for some level of excitement and independence. But there is quiet rebellion in Arras. A select few understand the danger of giving up young girls to the government to work in a sector that controls reality. Adelice’s parents are among these hidden rebels. They know that Adelice has the talent to weave the threads of reality, and they do not want her taken when her testing time comes. They spent years training Adelice to fail the tests – to conceal her natural ability to manipulate the warp and weft of time. Despite her efforts to fail, Adelice slips up and reveals her talent during testing. When government forces come to retrieve her from her home, her family tries to resist, and it is a bloody and awful scene as Adelice is dragged away. She is left not knowing the fate of her mother and sister, and wondering if her resistance to being taken has left them dead – or perhaps even worse, in captivity and the hands of manipulative officials. Adelice must quickly adapt to the lifestyle of a Spinster, not only for her own safety but also to protect her mother and sister, wherever they may be. Every time Adelice allows her rebellious nature to slip through, she is punished severely – and she fears that awful things may also be happening to the ones she loves. She learns to adapt a façade of compliance. Adelice learns that her talent for weaving is beyond even what she suspected. She quickly moves up the ranks of Spinsters and learns that she may be the only candidate for the top position of Creweler. The Creweler can not only weave the threads of time, but can create and destroy the elements of reality. It is a position of utmost power among the Spinsterhood. Despite the Creweler’s unique abilities to alter reality, she is still controlled by a male-only government. Albin’s world of Arras is intricate and fascinating. The roles that men and women play reflect the gendered tensions in our own society. Women are sexualized and men have power – yet everyone has strict guidelines that they must abide in order to maintain their place in society. If you disobey, your “thread” is removed from the tapestry of reality. This is the first book of a series, and Adelice only scratches the surface of understanding the complex manipulation of power that binds everyone to his or her role. She has been sheltered from the truth for so long that it takes the entire book for her to discover some of the lies. Given the slow pace of Adelice’s discovery, she doesn’t really have the capacity to be a Slatebreaking character in this book. Her reactions are immediate and uncontrolled, and she uses her weaving talent in impulsive ways. I was a little disappointed that Adelice did not turn out to be a more self-aware character, but there is definite potential there. I hope that book 2 of the series allows Adelice some growth and maturity. There is, of course, romance and involved. Adelice, like all of the girls in Arras, grew up in a segregated neighborhood in which young girls are raised separately from boys. As a Spinster, she encounters grown single men for the first time and has trouble managing the natural urges that she experiences. This leads to a rather annoying love triangle that I felt added unnecessary complications to the plot. It will be interesting to see how all of it plays out in the next book. Albin throws out loads of information in the last few chapters of the book. Events unfold so rapidly that I worry she has set up an impossible scenario to be explored in the rest of the series. Yet Crewel and the dystopian world within it are just interesting enough to warrant further reading. This entry was posted in Reviews, Young Adult and tagged crewel, Dystopia, futuristic, gender roles, weaving, ya. Bookmark the permalink. I’ve read some interesting things about Crewel (including debates on is/is it not feminist) and it has me intrigued. I think I’m going to check it out, but dystopian’s aren’t my favorite genre to read so I’m not rushing out to get it. I do wish it had more of the reclaiming domestic arts as a feminist act going on in it – that would have been awesome!